‘But cutting spending is soooooooo hard!’ many political people say. ‘It is so difficult to dooooo!’ others will whine. One of the reasons why it is so difficult to do is that so many legislators have absolutely no experience or training in running a business, large or small, and managing a budget with scarce resources to optimum benefit. With so many lawyers serving in elective office, what are they primarily trained to do? ‘Write more laws!’ silly! That is the sine qua non of many self-respecting lawyer-type politicians, especially if he or she is eyeing a lucrative legal/lobbying practice post-public service. We have some budgetary suggestions for our friends in elective positions in Washington and in state capitals such as Raleigh, North Carolina, mainly learned from 4 rugged years on the House Budget Committee in the early 1990’s. Rule #1? You can’t cut spending until you cut spending. Plain and simple. Rule #2? Don’t ever forget Rule #1. If you are of a mind to support small government, you have to cut spending and eliminate programs to do it. No amount of dancing around the table about raising taxes or cutting taxes or praying for a way to finesse the situation will work. Former Congressman Alex McMillan and I took on the arduous task finding some savings in the politically radioactive account called ‘Medicare/Medicaid’ in 1991. We ‘found’ $177 billion in spending reductions over the next 5 years. And lived to talk about it. North Carolina just elected the first GOP majority for both houses of the legislature for the first time since ’98. 1898, that is, for you keeping score at home. 112 years ago. Yes. One century plus 12 years. Their first Herculean ‘task’ they have got to pass? Find reductions totaling $3.5 billion out of a $19 billion budget this year. That is 18.4% just to make sure you are paying attention. The Fifth Task of Hercules was to clean out the enormous stables owned by the rich man, Augeus. His stable had not been cleaned out in years and after hundreds of thousands of animals passing through the stables year after year, Hercules had to figure out a way to do it. In one day’s time, no less. 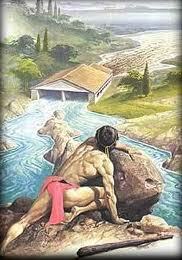 Hercules used his brains first to notice that two rivers flowed nearby the stable. So he cut some trenches and built a few bulwarks and diverted the flow of both rivers through the Augean Stables by the end of the day. Presumably, he re-diverted the river back to their normal course of flow by breaking the dams and letting the stables dry out overnight. So much for the EPA. Or the Water Purity Control Board of Hercules’ day and time. Without engaging in the more gruesome and vulgar analogies that can be drawn from this story, what can we learn from Hercules? 1) It had been a long time since the last thorough ‘cleaning’. 2) The cleaning had to be quick and had to be done fast. 3) It was the ‘fault’ of hundreds of thousands of actions taken before Hercules’ time. Any government program that was passed into law before 1930 and is still being funded at any level most likely should be repealed without a whole lot of deliberation. Any government program passed during the dark days of the Great Depression from 1930-1942 is probably due for a significant overhaul and reform. Times have changed. Any government program passed before 1970 needs to be evaluated for whether it has ‘worked’ or not and achieved its stated objectives, if there were any specific metrics stated back then. Any government program passed since 1980 needs to be examined and held at a constant level relative to last year while committees take a closer look at them to see if they need to be continued. In short, use this time to ‘clean out’ the Augean Stables of government spending for the first time in like 100 years. Make Hercules proud. Fortunately, North Carolina now has a Speaker in the State House, Thom Tillis, who can and will use his brains and experience to lead the way. He is not a lawyer. He has only been in government since 2006. And he was a management consultant expert to boot for years prior to running for office. The only thing left to think about is what river would be big enough to divert all of the ‘wasteful spending’ out of the US budget and which tributaries could be used to clean out the state budgets. One wag suggested that the Potomac was too small to divert through Congress. We are inclined to nominate Old Man River, the Mighty Mississippi Itself. Even it may not be enough. The stables would be more manageable with a more pleasant scent.